Open for tour from 9.30 to 18.00 daily. Visit early morning or late afternoon. We are comparing Teatro La Fenice Opera House Venice Tickets Prices from leading ticket suppliers and Try to find you Cheap tickets prices on the market. Founded in 1792, La Fenice Opera House has been the premiered some of the best operas of the 19th century and it continues to host a mix of contemporary productions, operas and stage shows. The stalls have been filled with an audience of over 1,000 people to witness the premiers of Bellini’s The Capulets and the Montagues, Rossini’s Semiramide and Donizetti’s Belisarius, to name just a few. In more recent years the theatre has hosted performances of Mosca’s The Killer of Words, Kegel’s Kidnapping in the Concert Hall, Britten’s The Turn of the Screw and Stravinsky’s The Rake’s Process. On a fast-track visit this famous Venetian Opera House you’ll get to skip the long entrance queues and use your extra time to explore the Theatre’s Grand Hall, Foyer, Apollonian Halls and take a seat in the Royal Box. Your multilingual audio guide will talk you through the life and history of the much-loved soprano singer, Maria Callas. And, there’s no need to rush through the exhibitions, on a self-guided tour you can take your time to soak up the atmosphere inside one of the world’s greatest opera houses. This tour is tailor-made for lovers of the dramatic art, theatre fans and music enthusiast. Fans of Maria Callas will enjoy the exhibition to her life and years performing before a Venetian audience. This is great for people who appreciate fine design and architecture, during the tour you’ll be able to tour the lavishly decorated halls and foyer. Your Experience With Teatro La Fenice Opera House Venice Tickets? Save time with skip the line entrance to La Fenice Theatre. Combine history with music and drama inside one of the worlds most revered Opera Houses. Discover the history of this popular attractions with a multilingual audio guide. Visit the Royal Box, Apollonian Halls, Hall Theatre and Foyer at you own pace. Visit the exhibition of Maria Callas. What Teatro La Fenice Opera House Venice Tickets Includes? Entrance ticket to La Fenice Opera House. Audio guide available in 5 languages (English, Italian, French, Spanish and German. 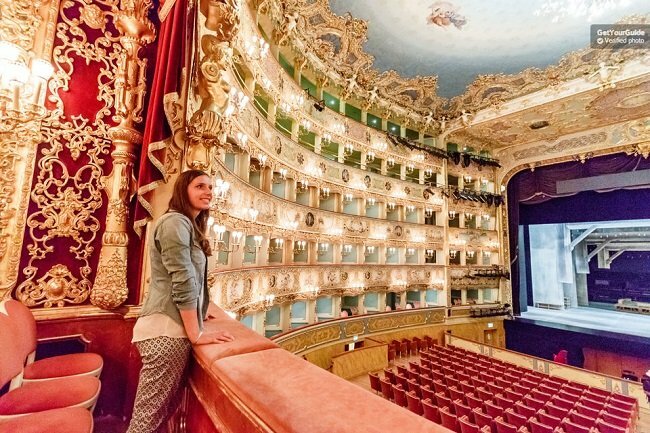 If you plan to see an evening performance at La Fenice Opera House then we recommend taking a tour in the late afternoon. There are restaurants located close to the theatre where you can get dinner before the show starts. Travelers Reviews about Teatro La Fenice Opera House Venice Tickets? This Venice attraction has a 4.5-star trip advisor rating from over 33,000 traveller reviews. It is one of the top places to visit on a visit to Venice. Skip the line entrance with audio guide ticket has also received 4.4 out of 5-stars from Get Your Guide users and 4.5 out of 5-stars from Viator users. Travellers have said that the theatre itself is magnificent and that the audio guide is very interesting. La Fenice Opera House is accessible to wheelchair users. The attraction is mostly on one level and to reach the Apollonian Halls there is an elevator. You will select your desired entrance time when making your booking, this is subject to availability, if your preferred time is not available then you will be issued with the next available time. Cancellations policies will vary depending on your ticket provider. Some ticket providers will issue full refunds up to a number of days in advance. No ticket will be refunded within 24 hours of departure. The theatre’s opening times may vary due to events and technical activities. La Fenice will close early (at 13.30) on April 28th and 29th. A live guide is not included in the ticket price. Meeting Point: You can go directly to the ticket office at the entrance to La Fenice Opera House. Address: Campo San Fantin, 1965, 30124, Venice.